Our company is well known in the market for the trader and export of a wide range of products such as the Stylish Childrens Wear which are available in a range of colors, sizes, designs and they have been bought from well known vendors in the market. These frocks are in step with the latest market trends and they have a very stylish look and give a good fitting for the customers. These frocks have been priced at very reasonable rates in the market and they are high on demand among customers. Being one of the most renowned and well known companies in this line of work, we are also providing our clients one of the most appreciable and admirable quality children wears. These Children Wear have been fantastically designed and tailored in a very trendt and fashionable manner taking into considerations the likes of the children. These children wear clothes have been manufactured using very much excellent quality fabrics which make them long lasting and relaxing to wear for longer duration of times. 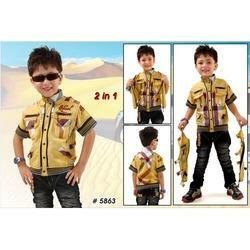 Looking for Childrens Wear ?